We went to Disneyland Paris. Sorry for the wait guys, I have been wanting to write this up since the second we got back but you know what its like… mum life! When we decided to book Disney we just did it on a whim, I’m the type that gets an idea in my head and then I have zero patience so it has to be done NOW. We looked to go at the beginning of December originally but decided that with Daniel having 2 weeks off over Christmas we should price it all up and perhaps because he wouldn’t need time away from work that it would be cost effective (he wouldn’t miss out on work or money). Then I had a crazy idea that New Year would be the perfect time as it would be Olives birthday, didn’t take much convincing we booked it almost immediately after our crazy chat. I think we felt all giddy at the thought of it, got a little excited, drank some wine and BOOKED IT! Honestly this is not the type of people we are, we don’t have ‘spare’ money to book holidays like this but after a year of us both working damn hard we wanted to spoil our little family. For the first time in a LONG time I had some savings, as always money burns a whole in my pocket- life is for the living! This was my gift to my family and it felt bloody good for the first time ever to give back to my husband who has since the day I met him given me everything and more. I wanted to mention this because (with the exception of our honeymoon) we don’t do luxury or expensive holidays and I would hate to think anyone would find me sharing our trip ‘braggy’ this wasn’t in anyway endorsed or sponsored hence why I didn’t tag handles etc because it wasn’t about anything other than spoiling the kids and making the best memories with them. We booked with Magic Breaks. So when we booked we used Magicbreaks.com as we had seen an advertisement for 15% off and half board meal plans if booked before a certain date, we added up the same package on the official Disney site too and in all honesty it worked out only a little cheaper through Magic breaks than it did Disney. Having said that they seem to always have deals on when it comes to meal plans so I would definatly consider booking with them again as having done the holiday now if we could save money on dining then I would in the future. When it came to booking our break sadly the deal had ended resulting in no meal plan for us, so we went self catering and fending for ourselves. There are pros and cons to this because we read so many reviews in the run up to our stay, any negative review I read was always in regards to food, restaurants and costs etc. There seemed to be a great deal of confusion on DLP groups about what and where the meal plans could be used, you could upgrade meal plans and use them to dine in certain places, others you couldn’t visit at all… it was all very confusing and in the end we were happy to be self catering as most people were advising any visitors over Christmas & New Year to book meals WAY in advance as most places were fully booked already, this was back in late October. Yikes! We didn’t want to do all that much planning in advance, we wanted to go with the flow and just eat when we were hungry so this worked for us and may not be as desirable for other families. TOP TIP: If you do book through Magic Breaks be sure to check out the voucher packs they send out via email. We printed them all off and actually they saved us some money when dining in Disney Village. We decided to travel via Eurostar, partly out of curiosity and partly because we do find flying with kids a bit of a pain. Mostly because of the transfers and the waiting around after check in etc. Yes with the Euro Star there is still some of this but it seemed like a quicker option and more direct. We paid for ‘Disney Express’ (around £45) which meant that whilst on the train to Paris a very friendly member of the Disney team would come over to your seats, give you your paperwork, your all important Magic Passes to get into the parks and then some luggage labels. Once the specific labels were attached to your bags you could drop them at the Disney desk in at the train station and go straight to the parks, no dragging them to the hotel or having to check into the hotel as ‘Disney Express’ did all that for you both into Paris and then back out to London. For us that was money well spent, we got to make the most of the first and last day of our trip. We also added our breakfast with the Characters and our NYE party tickets when booking through Magic Break, you can of course add them onto the booking later or even book them when you arrive in Disney but we didn’t book our trip very far in advance so we did it all at once to save disappointment. IF you are planning a trip over NYE you NEED to buy the NYE party tickets, the parks shut early and they only allow you back in if you have paid for a ticket. Even if you have park tickets for the day on NYE that does not include the evening, we saw some very cross and upset families that hadn’t realised this and it was pretty heartbreaking watching them receive that news. We stayed at Hotel Cheyenne. When eyeing up the Disney Hotels the huge changes in price baffled us, for me personally a holiday is not made up by how luxury the hotel is but I completely understand and appreciate thats not the case for all. When we visit a new place my main aim is that we spend our time seeing sights, exploring and spending as little time in the hotel as possible. So we straight away sought out the cheaper hotels which were the Cars themed ‘Santa Fey’ and then the western/Toy Story themed ‘Cheyenne’, as our kids LOVE Toy Story more than life itself we opted for the slightly (and I mean slightly) more expensive of the two. I know now that the hotels have way way way more to offer than I realised at the time of booking, they all have a range of activities, restaurants and bars. They also have Characters doing meet & greets throughout the day too, some of the bigger hotels have pools and are very well thought of with people wanting to spend whole days there. I can understand this now, Disney is exhausting and pretty over whelming as a short break so I would be very tempted to stay for longer next time and have a couple of days park free. Cheyenne was great though, I LOVED how quirky it was! When they say they are themed hotels they really mean it, we got back to the hotel on day 1 when it was dark and foggy, it was like straight up walking into a cowboy western movie, wooden shutters, cool names and signage everywhere. Could just be me but its all those small details that I love and appreciate. Cheyenne is a slightly different layout to your conventional hotel that is normally one big building, Cheyenne is made up of lots of little buildings like hotel blocks. This meant once you knew which building you were in it was easy enough each night to get to your room rather than making your way through a big hotel, only problem was that each block had a ground and first floor but no lift. Most people left there empty buggies on the ground floor each night but we just carried them up and down. The standard room was basic but super clean and was enough for us. Sounds silly but the shower was amazing, don’t laugh at me but I always judge the room based on how strong and hot the shower is and this hotel was one of the best. Ha! Plus the kids loved the little nods to Toy Story and it was a real talking point for them. There was also a Starbucks on site, a laundrette, restaurant, saloon bar and small store which sold merchandise, drinks and snacks. So that covers how we booked, how we traveled and where we stayed, hope that has answered some questions for you or given you an insight of some degree. I recently did a question box on Insta stories and the questions came flooding in, so the rest of the blog post will be answering your questions and hopefully that should help cover all aspects of our trip. There are so so many things I could babble on about but hopefully this will bring some structure to everything you need to know. How easy was it to book Meet & Greets? Did you use an app? So we downloaded an app called ‘LINEBERTY’ It was free to download and each morning at exactly 9.45am (French time) the available Character meetings will appear for you to book. Over the few days that we were there the characters were pretty much the same each day on the app. I imagine this will change week to week etc You have to act fast, the first morning I refreshed the app at 9.45am and watched 75% of characters book up in a matter of seconds. Good thing about the app is when you do get a slot it tells you how long you have until your meet, how many people are in front of you and it also sends notifications so you are reminded to make your way over. If you do miss your slot don’t panic, they are very understanding and allow you to still have your meet & greet just by showing them the app and your reservation number. There will be some Characters that are dotted around the park, keep your eyes open for queues or large crowds in corners or under shelters as thats usually where they are. There will be a sign with time frames, usually there will be 2-3 time frames so it might be that you note them and go back at a time that suits you better. You won’t need to use the app for these, however they do cap the queues as most Characters will be needed for appearances on the parades etc. Did you book restaurants in advance? Nope. The reason we didn’t was that we are the kind of parents that just feed on demand. We had no idea what level of busy to expect, no idea where we would be or what we would be doing at meal times. I don’t regret not booking in advance but there were times when I wish we had. Most of the time we were so busy, we forgot to eat and we would snack or grab bits from venders etc. Eating out with kids takes so much of the day up I feel, those 2-3 hours spent finding the restaurant, picking food, waiting for food, eating food etc etc was just something we couldn’t plan in advance for as we didn’t know where each day would take us. However, if you are planning on going out of term time, or over Halloween/Christmas then I would book perhaps a couple of restaurants in advance. Did you do a meal package? For example half board or full board. Annoyingly when we finally could afford to book the meal plan deals had ended, so we were fully self catered. I read in a few forums that you can upgrade meal plans once booked. You can even upgrade meals on a plan for Character breakfast or Princess lunches etc so thats something to consider if you do get a meal plan as part of your booking. Call Disney and find out your options in terms of upgrading for those special inventions as that may save money over booking the inventions separately. Was there anything you wish you had taken with you? Was there anything you wish you hadn’t taken? TOP TIP: You can hire buggies at the parks. On entering the park there is buggy hire immediately. The buggy actually looked like a really fab contraption as it was high and a proper little seat for older ones. Do you recommend the Character breakfast? Oh Yes! We loved it! Firstly the food choices were amazing, it was nice to actually enjoy breakfast as each morning we rushed in to use our magic hour or beat the queues so Me & Daniel missed out on breakfast whilst the kids ate food we had packed on the go. There were full English breakfast options, pancakes, waffles, fruit, yoghurts, continental options etc its buffet style which is always great for the little ones who like to keep their options open. I think there is around 5-6 characters during the breakfast, they all come around with an assistant who makes sure that no one is missed, it meant that when we were up getting the kids food we didn’t need to panic as they would come back and find us. I didn’t feel like they were rushing us, we got enough time to interact, get autographs and photos. I cant explain just how amazing the staff and characters are with the kids. If you don’t mind me asking how much was the holiday in total? Was it expensive due to the time of year? Arrgghhh it hurts me to say it but in total (without spending money) The trip cost around 2k, this was for the Eurostar return tickets, Disney Express, 3 nights at Cheyenne, 4 day park tickets, Character breakfast & NYE party tickets. It was more expensive due to the time of year for sure, however we didn’t realise that NYE evening would require extra tickets. On NYE the park clears out at 4pm and reopens later, you need a special wrist band to experience the evening and that was an additional cost. We had a look when we got home to revisit in March and I think if we booked a similar package to what we just had it would of been around £700 cheaper. Is the train station close to Disney? Also are the Hotels close to the parks? Yes, the train station exit is directly opposite the Disney gates and just a 1 minute walk. This is why we booked Disney Express so we could leave our bags at the station and head straight into the parks. The Disney hotels are all extremely close, they all have free shuttle buses I believe that take you to the parks but our hotel was one of the further ones out and it took us just 10 minutes maximum to walk from our room to Disney Village entrance. We avoided the buses because we heard that they are always busy and a little like London tubes. Would you say your two were old enough for the rides? Were there any they couldn’t ride on? This was something we worried about, I was told a few times that there wasn’t many they could ride. So wrong! There was plenty of rides for them, of course there were some that they couldn’t but those were way to old for them to experience anyway. I just approached the staff on the entrance and asked, to my surprise we were turned away very little times. There is without a doubt more they CAN go on than the amount they cant, I would say only a handful that they couldn't and even some of those Daniel was too chicken to go on. What are the must do’s for kids of a similar age to Oakley and Olives? Ok we may be here for some time. In terms of rides I would say the kids favourites were the more interactive ones, so ‘Buzz Lightyear’ is fab because they have guns and can shoot the alien targets, ‘Ratatouille’ is also great because there senses are tested with smells, 3d glasses and you even get a little wet. The ‘Slinky’ Toy Story rollercoaster was a good one because as far as Children’s rides go it was pretty fast and as ‘grown up’ as a Children’s coaster could be. The park is magical, there is no end of things for the kids to do when it comes to rides. We spent more time in the Studio side of the park than I thought we would but there was so many shows to see, again its that interactive side of things that my little ones like. They really enjoyed the live bands, performances, magic shows etc. They LOVED the Lilo & Stitch show, this is on every 15 minutes I believe and it was hilarious even for us, we watched it 3 times because the kids loved it that much. There is also a Disney Junior show on next door to this which is great for the little ones, especially if they watch a lot of the Disney Channel. I would recommend downloading the DLP app, so before you go you can check start times, waiting times for rides etc. Would you say Disney over New Year is worth it? NYE was an amazing experience, the party was incredible as there was so much going on, all of which were things that were completely new to what we had seen or experienced the other days. There was a huge 30 float parade, disco & dancing with The incredibles characters and a ‘Big Hero 6’ lazer show to name a few so it really was incredible but I woldnt’t be in a rush to go back when the park is that busy. It got crazy busy as the night went on and we soon realised that it was near impossible to get a drink from the few bars there were and it was going to be very unlikely to get a decent spot for the kids to watch the fireworks. We managed and we enjoyed it all the same because we had prepared for it but it does take some of the enjoyment away when its just turns dangerous because of heavy crowns and people barging etc. Any top tips on beating the queues and keeping the kids happy whilst you waited? So if you are staying in a Disney hotel you get a ‘Magic Hour’ this is from 8am-9am, it basically grants you entry into the parks before the general public. Using that hour to make the most of the busiest rides is a must! I think the best thing to do is eye everything up on day 1, once you know which rides are busiest or which of them you and your little ones love then you can use the hour to get as much out of them as possible. Also don’t forget to ‘Fast Track’, your magic card entitles you to as many fast tracks as you wish. However you can only fast track a ride one at a time, so if you arrive at the ride and your fast track ticket is a time slot in 2 hours time, you cant in that 2 hours use them for something else. I think we managed to fast track around 3-4 rides a day just to avoid queuing. Rides that didn’t have a fast track option will always show a wait time at the entrance so you never join a queue not knowing a rough estimate of the time you will wait, I always found that this time was a little off and majority of the time you were on the ride quicker than the estimated time. SNACK BAGS! We used some clear sandwich bags from Ikea with monster patterns on and each day we filled them with the food we had taken with us from home. Bag of mini bread sticks, dry cheerios, brioche rolls, rice crackers, biscuits etc then they also had 1 bag each which had things like chocolate coins, chocolate lollies etc we had some left over from Christmas chocolate, we never got those out unless we were in a queue that way when we did it would mean they were distracted for the best part of the wait time. I also took lots of photos and videos (naturally) so another little tip would be to watch them back as you queue, sounds very simple but if Oaks got a little impatient all I had to do was ask him if he wanted to watch the video of him and Spider Man and all was forgotten about. Was it too cold for the little ones? It was cold but I wouldn’t say ‘too’ cold. The temperature definatly dropped in the evening, we ended up buying a big fleece blanket from one of the Disney gift shops (30 euros later) The mornings were colder too but not like the evenings were. We were lucky with the weather I would say, it was dry and some days were pretty mild. We made sure the kids had thermal sets for underneath their clothes, we layered them up good each day and even took thermal pjs too just in case we needed them. If it had rained, it would of been a whole new story, we took wet suits just in case but it would of put a dampener on the holiday I think. What would you say YOUR highlight was over everything? Thats easy! The kids faces!! It was all about the kids and I would say my highlight was watching the NYE parade with them as the parade was bigger with way more Characters than we had seen on the previous days. It blew my mind so you can only imagine Oaks and Olives little faces. The atmosphere was amazing, it was Olives birthday, we danced together to the music and it (fake) snowed on us as we celebrated. It was pretty special! Could I handle Disney as a single parent? I guess that would depend on how many children you were taking? and what time of year you are going! I say YES, if I was going on my own I would take the train again instead of flying, I would pay for Disney Express as that helps ease the luggage situation and saves time. I would probably visit Mc Donalds more times than the once we visited HA! Then just take it at my own pace. How did you manage nap times? Neither Oaks or Olive nap anymore at home, so I wasn’t sure how this was going to go. We are very lucky and have 2 travel buggies which fold down incredibly small and fit into bags etc So we took both with us but in the end we only really used them both on NYE. I could just tell when one of them could do with a nap so would pop them in and go for a walk, sometimes leaving Daniel with one to have some one on one fun which actually worked out nicely. Both of mine will nap in a buggy even in a busy environment so we didn’t go back to the hotel we just stayed put in the parks. I think I read that you had been to Florida as a child, how did Paris compare? I visited Florida when I was around 8 and then again at 11 (I think) Honestly I cant remember the trips all that well, but what I do know is that they are obviously amazing and on a completely different scale. We would LOVE to take the kids to Florida and I think we will but we will wait around 5 years. DLP is the perfect place for children of a younger age I feel, its not too overwhelming, theres enough to do and see. You could easily spend 5-7 days in DLP where as each time we went to Florida we stayed for 2 weeks so I can only imagine how much of a cost it must of been for my parents. I know both Oakley and Olive won’t remember this trip, but me & Daniel will, Florida is the type of Holiday that I would love them to be older and appreciate more. Would you say there was enough for Olive to do? Or was she too young? This question has been asked so many times, when I told people we were going I must of heard ‘We are going to wait until the kids are a little older’ around 100 times. They were honestly the most perfect age for it, because to them magic is real. 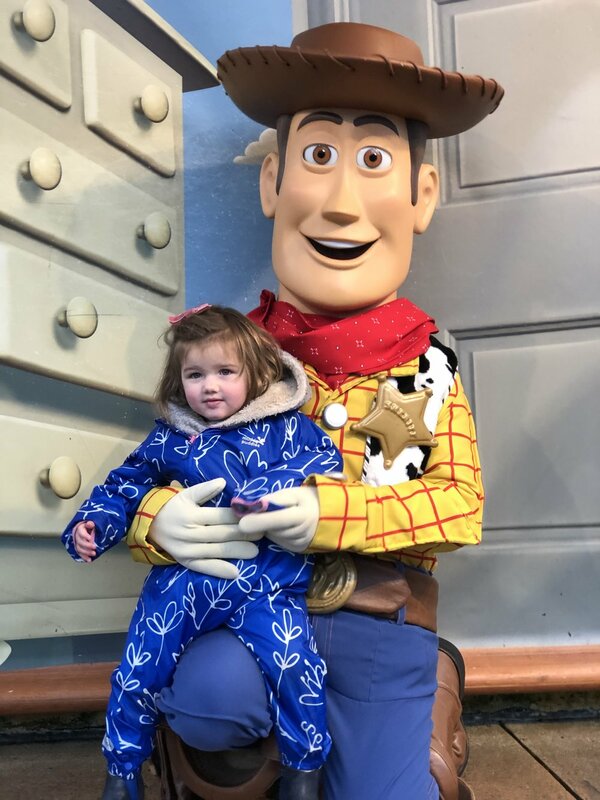 There was no costumes just characters in their eyes, they were constantly excited about what was around them because they recognised it from there favourite films etc I can’t really put into words just how surprised we were with Olive, she embraced the trip even better than Oaks, infant her age was absolutely perfect for the trip. She went on every ride that Oakley did, she loved the performances and funnily enough had all the patience when it came to watching shows and parades. She took to the meet and greets so well and if anything it really bought her out in a confidence level we hadn’t seen before. Thank you as always for taking the time to read this blog post. Hope you’ve found it helpful in some way, or just enjoyed having a nosey at our holiday. We really did have a magical trip, stressful in areas but on the whole it was amazing! We went with low expectations (just to avoid disappointment) but we all left completely blown away. Memories that I will treasure forever and a burning urge to rebook and head back soon! Taking one HUGE leap of faith! How I got here. AD/ Why I feel lucky to be a Millennial parent!